The unit reviewed is an early-2019 model, supplied in Jan/Feb 2019 and operated by a new Windows 10 Huawei MateBook laptop. The ASRA is a little schizophrenic – the installer software comes on a fancy USB memory stick so is all modern, but as part of the install process it then crashes you back to something circa 20 years ago. I have been using ASRA audiometers for a long time now, covering quite a lot of individual units and multiple installs, and I have to say that not once have I successfully installed the software without any kind of hiccup. It has got better, much better though – in the old days I eventually gave up on some laptops but that is a long way back into history now thankfully. My most recent install was in March 2019, installing onto a brand new Windows 10 laptop. It went largely OK, but then when the audiometer was connected and the software started up, I hit ‘run’, and the software immediately shut down every time. Delve back into Device Manager to find the USB device that way, tell it to update the driver, point it back at the GM Instruments USB stick, let it do it’s stuff and it was working. Pretty straight forwards if you know what you are doing but a lot of people would fail at that step. Next is a proper old-fashioned bit of fiddling. By default the audiograms are headed ‘ASRA AUDIOMETER’ and ‘GM Instruments’. Clearly you need to change that and the way to do it is to manually alter a couple of .ini text files. If you are confident with computers this is no bother at all, but if you are not comfortable with that then it’s a bit of a hurdle. It is covered in the user manual but in 2019 it’s not really good enough to be honest – this should be dealt with by an option in the ASRA operating software. As a note, when you install the software it will ask you if you want to adjust these .ini files then. Whatever you do say yes, as finding them afterwards is a complete nightmare! Not helped by the fact it is in a folder which is normally hidden by Windows. These things are absolutely bullet-proof. I must have had eight or nine ASRA audiometer over the years and they have never gone wrong. Not once. In latter years they were mounted in trailers and vans meaning in winter they would be at -5 or even colder over night, then the technician would come in and turn the heating on, pushing it quickly up to 21 or 22 degrees. The condensation must have been horrendous but not once did they fail. Daily verification checks were fine and come calibration time, they were all always in excellent shape. In at least 15 years of using multiple ASRA units, I never once had a problem with the ASRA audiometer itself. (There were problems with headphones and buttons over the years but that happens with any audiometer in daily use, especially as most audiometers use the exact same headphones). This is very much a huge positive for screening audiometry - the ASRA does one thing, and does it well. That means the software is simple and no overly-complex to get lost in. I had an Amplivox PC850 once and hated that thing - tried to do way too much and just made things unnecessarily complicated. Simple is good - it does its job and lets you get on with yours. The audiograms are superbly clear and results are categorised instantly. If you have historical results you can open them as well on the same audiogram, as many as you like, which is again excellent for looking at historical trends for a person. I often do this not only to look at the most recent for Category 4 determination, but also to look way back to see how the long term progression is for them. The software is simple and once installed doesn’t have a lot to go wrong. And massive bonus points to GM Instruments for not tying it up in copy protection. It means that I have three laptops which may use one audiometer, and a desktop iMac on which I sometimes need to open and view the audiograms, and all can have the software as needed. With other products, some companies limit it to one install per user which is ridiculous – if you need it to operate the audiometer and to see the results then what does it matter how many computers may operate the equipment – only one can use it at once. Huge thumbs up to GM Instruments for being so sensible with theirs. Like the install process, the software is looking a bit long in the tooth. It doesn’t need a major overhaul as it doesn’t need complicating, but a nip and tuck here and there would be good. For example, having a simple pause button would help a lot. If someone is not quite getting it, then being able to pause a test, talk to them, then set it going again is very useful. You can actually do that with the software, just that you have to press the ‘auto-test’ menu item and that pauses a running test, then pressing it again unpauses it. Not overly intuitive. Same with being able to re-start an ear if someone is making a right hash of it – you can’t manually stop a test and restart that ear (that I’ve found anyway) and that would be hugely useful. At the moment, if you want to stop a test, the only way I’ve found to do it is to pull the cable out of the booth so that tone ‘fails’ then choose the option to cancel the test in the window which appears. Another vitally important feature of all audiometer software is being able to input data from previous tests which may have been done by another company or audiometer. The ASRA includes a tool to do this but, whereas the install software is like something from 20 years ago, this is like something from 30 years ago. It is a command line prompt where you type the data in. Get a character wrong and it shuts down. It’s terrible and would barely have been acceptable in 1999, never mind 2019. This is all assuming you can find the damn thing in the first place - searching the entire hard drive for ‘audfile’ is the only way I’ve found it. This should be a menu item in the ASRA operating software. There is nothing wrong with manually entering the data, that’s a very useful feature, but it should not be via a command line prompt these days. Handily, as shown above, it colours the current graphs as red and blue, then any old ones as black, so you can easily see which is which. Except at random intervals, pretty much every day, it also shows the current left ear as black as well. A minor niggle as you can still see via ‘x’ and ‘X’ which is the current one, but it would be handy if it didn’t do that. Every ASRA and software install I’ve ever used over the years, with mulitple audiometers and laptops, has had that quirk, up to and including the latest one. Right ear gives red for current, and black for historical. Left ear randomly gives black for both. One file per person rather than multiple ones for multiple tests would be useful so you could associate notes with them as well for future reference. And in-built ability to print to PDF would be like manner from Heaven! The software prints to whatever is the default printer so you don’t get the option of changing printers. If you got a print dialog first it would be great as you could print one to a physical printer, and then a second to a PDF file for saving as part of the employee health record. (Yes, the audiogram is also saved anyway, but a PDF copy is much more versatile as part of an employee health record). Being able to choose a printer before printing would be a welcome addition. I’m pretty good on all things IT and am a bit of a nerd, but eventually I had to give up running the ASRA on a Mac. I was using Parallels to run Windows 10 on a MacBook Pro, and the software did work, but not reliably. One day all would be fine, then the next it would fall over whenever run was pressed, or give a series of error messages when a manual tone was generated, then present the tone just fine. Or sometimes not present the tone. It does work, kind of, but in the end I had to give up and switch back to a Windows laptop where it worked absolutely fine again. So my recommendation, don’t bother with Parallels as having Windows and MacOS running together causes problems. Maybe Bootcamp could work as you boot straight into Windows so avoid having two operating systems arguing over controlling the USB device, but if you are doing that then you may as well have a Windows laptop. I got a cheap Huawei MateBook and keep it just to do hearing tests with now and it works perfectly. ✔ Does manual or automatic tests. ✔ Great presentation of results, especially for year-on-year comparisons. ✔ After-sales service from GM Instruments is good. ❌ Software install is a bit hit and miss – can still take a little fiddling to get going. ❌ The need to mess with .ini files is not good enough. ❌ Manual creation of historical audiograms is terrible. It is vital but how you do it is very poor. While I would dearly love to see some modernisation in the ASRA software, it doesn’t actually need much more adding to it in terms of overall functionality. 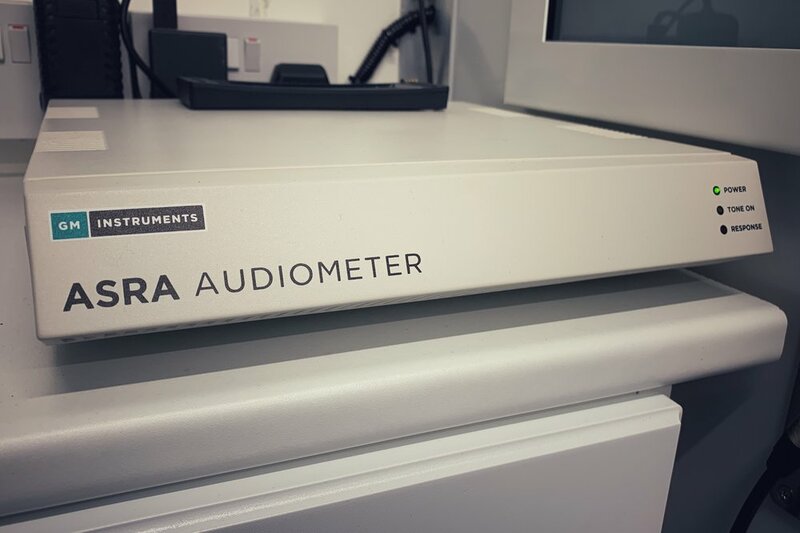 The database systems of other audiometers are hopelessly over-complicated and try to do too much – the ASRA does what it does very well and doesn’t need bloat adding, just bringing into the 21st century. Physically they are superb pieces of equipment – reliable and work month after month, year after year. They don’t have many bells and whistles and look a bit simple, but you don’t want bells and whistles, just reliable, fast performance. I would phrase it that a bit of a polish and updating is needed for the software, but don’t change the underlying product as it is exceedingly good. It is worth flagging that in the last few weeks the ASRA has had a physical redisign and it’s got bendy sides now. I still, after all these years and when spending my own money on audiometers, would never choose anything other than an ASRA. I think that says it all.